2016 is soon over - and this has been an interesting year for the e-paper industry. In 2016 we continued to see the trend that began a few years ago - with the focus of the industry on signage and retail applications rather than e-readers. Will Samsung release an E Ink cover for the Galaxy S6? What will be the most popular E Ink stories in 2016? We will soon post our yearly review, stay tuned! The Triby is Invoxia’s new connected speaker. It can play music from your cell phone (or connect to music apps like spotify), make in-group VoIP calls and send messages, on top of being the first non-Amazon device to take advantage of the Alexa Voice Service. The Triby includes a 2.9” active-matrix (296x128, 112 PPI) E Ink panel, and the company was kind enough to send a review unit to E-Ink-Info. The Triby is a great looking device, with a fun design that can be defined as retro-chic. It actually reminded me of an old-school kitchen radio - which it sort of is, but with a modern twist. The Triby has physical buttons for options like volume control, contact/radio station selection and an Alexa button. A nice touch was a yellow flag that pops out the side of the device to signal receiving a message. After someone reads the message, they can push the flag back in and the sender will get a notification that their message was read. 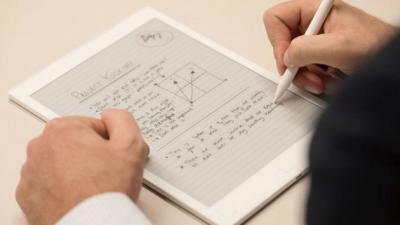 reMarkable is a "paper tablet", or more precisely a 10.3" 1872 x 1404 E Ink tablet. The display is relatively fast (55 ms) and supports pen input. Other features include 8GB of storage, 512MB of RAM, a 1Ghz ARM A9 CPU, 3,000mAh battery and ePub and PDF file support. Dasung launched the Paperlike - a 13.3" 1600x1200 USB E Ink monitor back in 2015, aimed to be a secondary computer display for reading documents. Dasung's monitors have been shipping through IndieGogo and are now finally arriving at Amazon.com, for $1,049.